Went to see Culture Club at The SSE Hudro in Glasgow in November 2018. Support acts were brilliant. Tom Bailey sounds exactly the same now as he did back in the 80's. Belinda Carlisle was great as well. A true step back to the 80's. There was also a local band invite to perform at the venue, this was their first time in a large venue. Main act Culture Club didn't disappoint when they started the well known songs. The opening song was new to probably most of the audience & would have been better placed further into the concert. From It's a miracle, a personal favourite, through Victims, Church of The Poison Mind, to the finale - Karma Chameleon they had the place buzzing. A great show, by a great showman & band. Even a mention to the brilliant Helen Terry from the early days. If you ever get a chance to see them. See them, you won't be disappointed. Having seen Culture Club several times before I have to say this concert was one of the very best. The backing singers were excellent, the musicians outstanding, the set was striking, Roy and Mikey were fantastic (Roy’s piano playing came as a lovely surprise) and George was, as always, the most charismatic showman and entertainer you could wish for and has the voice of an angel. Couldn’t recommend it more! One of the most outrageous bands of the extravagant eighties is back AND with their original line up! Culture Club are synonymous with the flair and wild creative passion from the decade and beyond. Now they are ready to return with their exciting upcoming album Tribes. Already enjoying feverish press attention, the upcoming record will be joined by tracks from such classic albums as Kissing To Be Clever and Colour By Numbers meaning you will enjoy the latest numbers plus your absolute favourite tracks from a band that have enjoyed rave reviews for their live performances over the years. They have dominated the charts all over the globe with such classic hits as I’ll Tumble 4 Ya, Do You Really Want To Hurt Me and Karma Chameleon. Ubiquitous, salacious and sensationalist, there isn’t any part of the world that has not heard of megaband Culture Club. Not only have they changed planet Earth to become forever more glamorous, the Grammy Award winners have sold well over 100 million singles and over 50 million albums. Having earned seven straight Top 10 hits in the UK, earned nine Top 10 singles in the USA and enjoyed nine Top 20 singles in Australia, they have cemented their place in pop history after they became #1 in the singles charts over a dozen different countries, have international multiplatinum album sales and were the very first group since The Beatles to have three Top Ten single hits from their debut album - plus are the only ever act to have a Diamond certified. Led by the iconic Boy George, see guitarist and keyboard player Roy Hay, drummer Jon Moss and bassist Mikey Craig once again reunite for a truly spectacular night at SSE Arena - Wembley, London on Wednesday 14th of December. 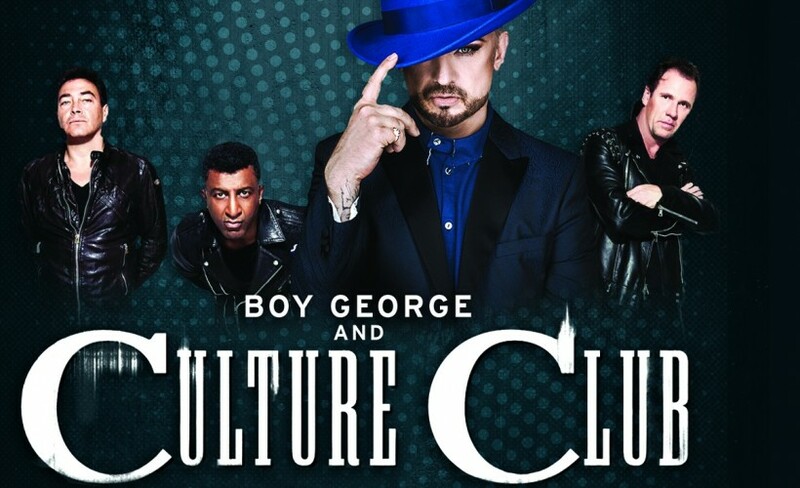 Book your Culture Club tickets today! These concert tickets are not expected to last for very long so don’t delay and book yours today. And remember, for the best experience get your gig tickets through Gigantic.